As a child, I always thought the national sport of India was Cricket. There has always been a lot of pomp and show around the sport. So much so, for most of us cricket is an obsession. The sport has crept into our lives and made its presence so strong that almost all of us Indians live, eat and breathe the sport, irrespective of whether we are actually playing the game. Oh! By the way I was talking about the men’s cricket team in our country!!!! Unfortunately this is the truth. 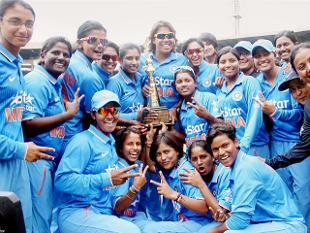 Most of us are seldom aware of the existance of a women’s cricket team in the country. And even if we did know such a team existed, how many of us actually know the players??? Wonder why we fail to acknowledge their contributions to the sport in the same way as the men’s team. The New Zealand women’s national cricket team has been touring India from 28 June till 15 July. The teams have been playing a series of five One Day Internationals (ODIs) and three Twenty20 Internationals (T20Is). All the matches including five ODIs, three T20I and one tour match against India have been hosted at Bangalore. I caught the live telecast of the first ODI on Star Sports. It sure was a fun match to watch. But what really hit me odd was the empty stands of the stadium. Was wondering if a similar tour by their male counterparts would garner a similar audience. Anyways, the Indian team crushed New Zealand by nine wickets in the fifth and final one day international match winning the series by 3-2 margin. The win also brought another piece of good news as the Board of Control for Cricket in Indian (BCCI) announced a cash award of Rs 21 lakh for the team(by the way that’s for the entire team, and not for an individual player) as they fought back valiantly from being 1-2 down to win the series. It’s time we acknowledged the contributions of all sportsman(may be woman here) equally !!!! Well cricket is the most followed sport though not national game. The NZ tour of India started and concluded on the same stadium. They didn’t even move to any other venue. All of the matches of the tour were played on Chinnaswamy, Bangalore. Indian women team is at 7 and NZ team is at 8 in the world ranking. I would like to raise one thing. The men’s cricket team is been followed and worshiped happened over a decades of effort and wins. Them meeting the expectation of the fans was a major contributor. I agree, that women team also needs to be supported and appreciated, but comparing them to men’s team is not fair at all. Its not just the fans, they have also not performed to meet expectations too. If you argue about the facilities, then, I would say that these are the same conditions once the men’s team also went through. You have a point here, when we at Bangalore training for our hypnotherapy the girls cricket team was training too, the staff in charge she was so terrified when I asked if I could blog about them. She said she had to ask her superiors. despite of being a person who thinks cricket is a waste of time, I thought it was pretty unfair. When Women’s team recently won Soccer WC in US, there was a huge uproar over the Prize Money which was much less than what FIFA pays for Men’s WC. It is about time due recognition is given to all, irrespective or their Sport or Gender. Yup… i feel sport is sport.. and lets recognise the contribution done.. irrespective of gender. Cricket is overhyped in our country, almost a religion to many…still, I wonder how many of us are aware of the existence of the Indian women cricket team. nice article, but same time if you think about badminton Saina and tennis Sania , do anyone know badminton Indian Man players who are in rank 10 ?